For Microsoft's Project Scorpio to be successful – whatever it's called, however much it costs – it needs some flashy games that squeeze every ounce of power out of it. That means developers need a solid developer kit that not only helps them get their games running on the new system, but makes it easier. The details we've heard previously seem to make a good case for that, and Microsoft confirms it all in this official video featuring Xbox Director of Programming Larry Hryb interviewing Kevin Gammell of the Xbox engineering team to lay out the features. Indeed, this thing packs a ton of RAM and gives developers ways to stack the systems up and get software loaded on them faster. Despite how the system might look, don't expect Scorpio to look quite like this. Scorpio won't be dotted with buttons, won't have an on-system display, and won't feature the Debug port they show on the back. It also won't look just like the Xbox One S as this thing does. 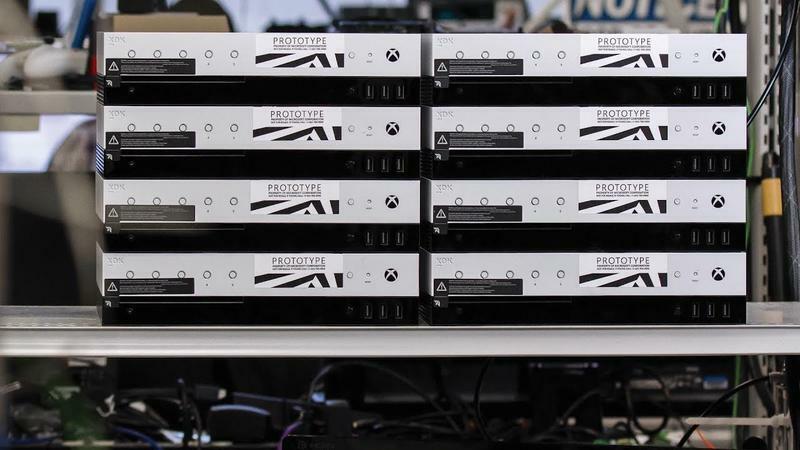 Development kits have often looked quite a bit like their retail counterparts in the past, but Microsoft showing this one ahead of the launch suggests that won't be the case with Scorpio. The most interesting bit of the exchange, which is a little more scripted than I would've hoped, is the chat about Microsoft's Dolphin software. Usually when someone talks about a video game prototype called Dolphin, they're talking about the pre-launch name for Nintendo's GameCube. Here, though, it's a piece of software that Microsoft implements on every Xbox that helps verify some elements of the system's inner workings. It seems like a sort of "Hello World" application for the Xbox family. In just a few days, we can expect to find out what the actual Scorpio system looks like when Microsoft's E3 show begins at 2 p.m. PST on Sunday, June 11.